The premise of our analysis is simple, the factors weighing on foreign investors and Bitcoin investors are that currencies are fluctuating wildly, local stock markets are declining and local economies may be contracting. All of this operates as a means for investors to turn to a “protectionism” stance where they attempt to protect capital/cash and attempt to limit downside risks. The fact that Bitcoin has yet to break higher and has continued to fall under further pricing and adoption pressure means those investors that were hungry for the next great rally may be getting tired of waiting for this next move – if it ever happens. Our belief is that any downside pressure in Bitcoin below $5800 will likely push many crypto enthusiasts over the end and prompt them to sell out before prices attempt to move down further. Our research team believes a deeper downside price rotation is setting up in Bitcoin that will push prices below the $5000 level before the end of this year. The uncertainty of the global equities markets are creating an environment where cryptos have simply lost their appeal. There has been no real substantial upside price move over the past 6+ months and the FLAG formation setting up is a very real warning sign that the eventual breakout move could be very dangerous. 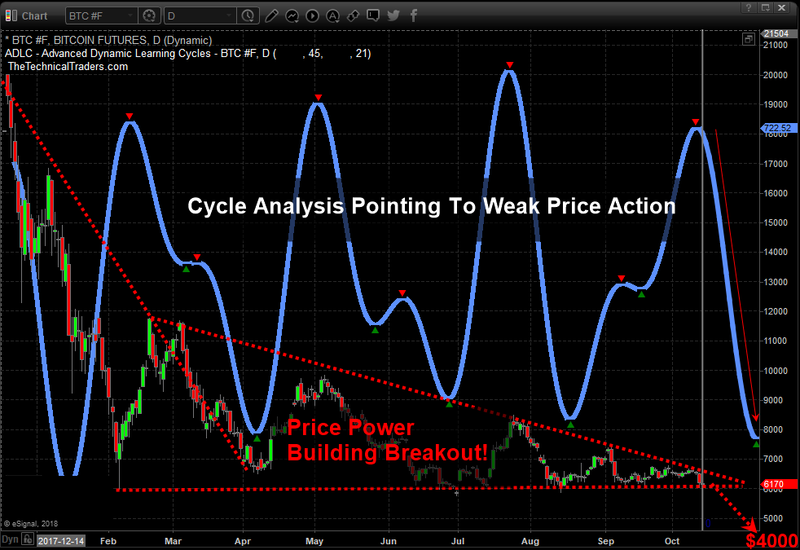 Additionally, when we add our proprietary Advanced Learning Cycle system to the research, which points to much lower price rotation over the next 30+ days, we begin to see the very real possibility that Bitcoin could fall below $5000 very quickly and potentially target $4000 as an ultimate low. As much as we would like to inform our followers that we believe Bitcoin will rally back to $18k fairly quickly, that is simply not the case. All of our indicators are suggesting that Bitcoin will fall to below $5000, and possibly towards $4000, before any real support is found. If you are a bitcoin believer, be aware that you may have a substantial opportunity to use your skills at this price swing plays out. Looking to buy back in near $4000 is much better than trying to hold for an additional $2000 loss. Visit www.TheTechnicalTraders.com to learn more about our research team and resources to help you become a better trader. Be prepared and build your skills to target greater success with our dedicated team. Read some of our other research to see for yourself how well we've been calling these recent market moves. Isn't it time you invested in your future success?